A separation of the rectus abdominus muscles during pregnancy is normal. It allows the belly to expand and make room for the growing baby. This separation, called diastasis recti, not a tear or a hernia. It’s simply a thinning and widening of the connective tissue between the two muscles. After pregnancy, there are exercises that can help bring the muscles back together. Traditional abdominal exercises, such as sit-ups, put too much stress on a postpartum tummy and back, and are not recommended for new moms. These exercises are designed to target the area most weakened by pregnancy—below the belly button—without creating stress on the back and abdomen. They’re amazingly effective, but it’s important for you to go slowly and master each level before moving on to the next one. A C-section mom can start these exercises once the incision has healed (stitches are dissolved or taken out) and you don’t feel pain when contracting your tummy. If you had a vaginal birth you can get started once any incisions or tears are healed. The first exercise to try is simply pulling your belly button in towards your back. Hold for five seconds and release. Keep breathing as you hold and try and work up to 5-10 of these contractions several times a day. Basic breathing: Lie on your back with your arms at your sides, knees bent, feet resting on the floor. Inhale and exhale a few times. Don’t flatten your back or tilt your pelvis, just let the natural curve in your back remain. Breathe in slowly and deeply. Now, breathe out and tighten your tummy muscles, pulling your navel towards your spine. Remember to concentrate on contracting the muscles below your belly button without flattening your back. When you are able to contract and relax your abdominal muscles without moving your back, you have learned to properly isolate the correct muscles. Lie on the floor with knees bent and arms at your side. Hold your tummy in by doing your basic breath contraction. Keeping one knee bent, slowly slide the opposite leg out until it is straight with the floor, and then slide it back up to bent knee position. Relax your tummy. Repeat with the other leg. Remember not to flatten your back and to keep the curve of your spine relaxed. When your abdominal muscles are contracted it helps to stabilize your pelvis while your legs and lower tummy muscles work. This prevents strain in your back muscles, and trains your abdominal muscles to protect and support your spine. Aim for 20 legs slides on each side. Lie on floor with knees bent and arms at your side. Pull in on your tummy and hold, then raise one knee towards your chest and slowly straighten it out parallel to the floor—about 2-3 inches above the floor without touching it. Return extended leg to starting position, knees bent, feet resting on floor, tummy relaxed. Repeat on opposite side, keeping one knee bent as you extend the other leg. Work up to five repetitions on each side without stopping, building to 20 repetitions or more on each side. Use you basic breath as you bring your legs up one at a time towards your body with knees bent. Keep one leg bent as you slowly lower the other leg down to the floor and back up. Repeat on the opposite side, working up to ten times each leg before moving on. Use your basic breath as you bring both legs up, knees bent. Slowly extend one leg out, parallel with the floor but not touching it. Return the leg to the starting position and repeat with opposite leg. Work up to 10 repetitions each leg. With each repetition remember to keep breathing, contract your tummy as you move, and don’t let you back pop up. If the arch in your back keeps popping up during the exercise, then you’re not strong enough to progress to this level, and need to go back to the previous exercise until you build greater strength. Repeat 20 times on each leg without discomfort or arching your back. Bring both legs to your chest using your basic breath one at a time. Straighten both legs up in the air, at a 90-degree angle from your hips. Keeping your legs together, slowly lower them down toward the floor. Only lower your legs as far as you feel comfortable doing so. If you feel your back beginning to arch, bring your legs back up and lower legs again only as far as you can without arching the back. Work up to 20 repetitions. If you notice back pain with this exercise, discontinue. Note: Before you do any abdominal exercises, you should consult with a physical therapist to find out just what’s going on with your abdominal muscles. 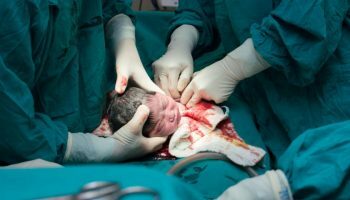 Fertility & Conception C-Section: Is That A Good Thing Or A Bad Thing?